I wanted to update you on our wonderful little pug Phoenix (aka-Feeny). Phoenix entered our lives in August, thanks to you,we could not be happier! He loves to cuddle and shower us with kisses. He loves to play and sleep with his “moo moo” a toy cow. His favorite thing to do is wake up daddy in the morning and climb under the covers to snuggle. Phoenix is soooo happy to finally have a good home! 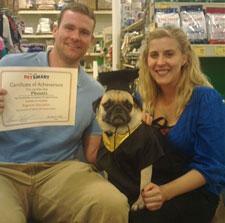 He did have some training to socialize with other dogs and we are proud to say he graduated with flying colors!!!! Go Feeny!! Thanks again for our special pug and all that you do for furry friends everywhere!!! !